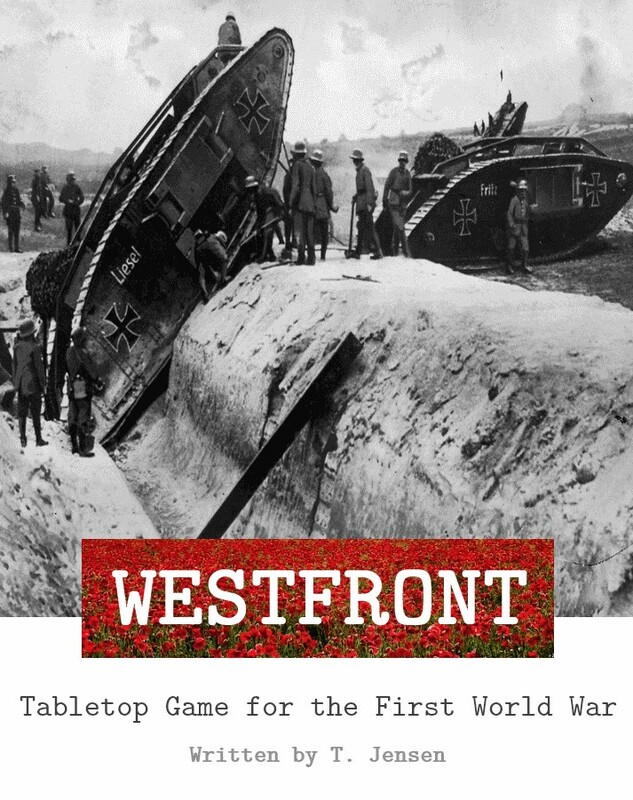 Westfront is a company to battalion level game for WW1 forces, designed for 1/72, 15mm or 10mm miniatures. Smaller scales could also be used. Westfront is designed with simplicity in mind, but since it represents communication issues, orders from above, random events like units becoming lost, as well as the actual movement and attacking of the various types of forces, it can become quite in-depth. Westfront has a fairly free-form army list composition; allowing players to choose infantry, cavalry, vehicles, various types of artillery, fortifications and barbed wire at their will. Units behave historically, and 4 different theaters are available to play in. Some will have a higher chance of poor weather, and if the entire tabletop is mud units like armored cars simply wont be able to function. Thankfully season is determined before players write their army lists, so they will know ahead of time what to expect. Early war (1914 - 1915) will have only the most rudimentary artillery usage in preliminary bombardments, and only the basic units available (no tanks!). Mid War (1916) will see the standardization of the creeping artillery barrage (which really works in-game: artillery provides cover as troops advance, and causes enemies to keep their heads down if it explodes near them), indirect machine gun fire and of course the introduction of the first Mk.I tanks. Late war (1917 - 1918) will see advanced infantry tactics like Germans advancing machine gun teams through creeping barrages to set up in no mans land, and the introduction of more refined tanks and German anti-tank rifles. Anyway, might be worth a look. I am always keen to see how the Great War is approached in tabletop games. I am always keen to see how the Great War is approached in tabletop games. I put it off for many years, thinking it would be boring and static, but then I started to learn more about WW1, going beyond the stereotype, and delving into the first hand accounts. Once I started working out what it was really like, I knew I had to try to capture that on the tabletop. The first hand accounts really were my basis for the game. I agree. Especially Eastern Front and Middle East were highly dynamic theatres.